It's time for another episode of 205 Live on the WWE Network! Kalisto was the fun loving LUCHA! LUCHA! champion of the division, but Enzo Amore stole the prize from him at WWE TLC. Kalisto has invoked his championship rematch for tonight. Will we see the title change hands again? Hit F5 or refresh for the latest updates while the show is in progress! We start out with clips from WWE TLC during the Cruiserweight Championship match where Enzo cheated (poked Kalisto in the eye) to regain the title. Tonight, the former champ gets a chance to get it back. Cue the opening! Vic Joseph and Nigel McGuinness welcome us to the show and talk about said rematch. Nese locks up with Alexander, pushes him off, and does his "Premiere Athlete" pose. Nese kicks him, arm wringer, Alexander counters, trip, slides under a leapfrog, backflips into a headscissors, dropkicks him, and a chop. Swann tags in, jumping kick, Rolling Thunder splash, 1-count, snapmare, kick to the back then puts him in a chinlcok. Nese escpaes the hold, Dar tags in, arm wringer, Swann rolls through to counter, rear waistlock, Dar counters, Swann with a back elbow, flips over him, Nese blind tags in, Swann rolls Dar into the ring and Nese blindsides him with a running back elbow. Nese whips him into the barricade, admires his muscles, rolls him back in, Swann fights back, Nese prevents him from reaching, back suplex, Swann lands on his feet, Nese with some kicking combos followed by a sweep, then tags out. Dar hits a European uppercut, stomps on him, snapmare into the ropes, and throws him into the corner. Nese tags in, slams his head on the turnbuckle, puts him in the tree of woe, knee strikes, drops down and does the bicycle kicks. Dar tags back in and does the ab crunch kicks with Nese coaching him. Swann goes for an inside cradle for 2, Dar goes on the attack, Nese tags in and keeps him down in a corner. Swann fights back, Nese catches him, running forearm, Swann with a roundhouse kick, makes the cover, but Dar pulls him off the cover to save the match. Dar is the legal man now, blocks the tag, forearm, whips him across the ring, Swann puts a boot up and both men are down. Alexander gets the hot tag, takes Dar down with some kicks, lands on his feet, hits a hard back elbow, connects with the handspring enziguiri (called The Neuralizer) and gets a near-fall. Nese gets dumped onto the floor, Alexander gors for the springboard, Dar blocks it and locks in the guillotine. The Brian Kendrick and Jack Gallagher are now standing on the stage. Nese pulls Swann off the apron, tries to throw Swann into the ring apron, but Swann swings around and does a headscissors to Nese on teh floor, breaks the submission in the ring, then takes Nese down with a phoenix senton. Alexander drops Dar with the Lumbar Check and gets the 3-count! WINNERS: CEDRIC ALEXANDER and RICH SWANN. Gallagher claims they are here to extend the olive branch of peace. Kendrick says they mistook Alexander and seems proud that he showed a bit of cruelty. He adds that Cedric will not have enough potential to be on their side as long as he hangs around Swann. Gallagher tells Alexander that he was like him back then but says the crowd and Swann don't matter. He claims he and Kendrick have enough cruelty to get to the top. Gallagher says next week they are coming for Swann, and Kendrick says if Alexander doesn't come to a decision then they will make one for him. Breaktime. Drew Gulak heads to the ring next for a match. Two weeks ago he brutally attacked Akira Tozawa with his sign post. Gulak claims to believe in a better 205 Live, says fear silences people, and blames "the powers that be" for cancelling his PowerPoint Presentation. He wants his own Drewtopia, complains about Tozawa's "AH! AH!" chant then says he is staging a protest meaning no more matches tonight. NOW he wants to start his PowerPoint Presentation from the BEGINNING! "Slide #1: No Jumping Off the Top Rope! This is the most important rule and it is constantly violated by every member of the locker room! Did everybody get that?" Gran Metalik, the master of the ropes, interrupts and heads to the ring for the match. Gulak shouts "You stay on the ground" before locking up with him. They wrestle around until Metalik puts his head in a leg scissors. They reset, Greco-Roman knuckle lock, Metalik with an arm wringer, hammerlock, Gulak counters to a side headlock, Metalik pushes him off, drop-down, handspring backflip, headscissors, gets tossed onto the apron, kicks him in the head and connects with the springboard missile dropkick. Metalik walks across the top rope before lands a moonsault to the floor! He throws him back into the ring, gets on the tope rope, Gulak knocks him down, stomps on him, slap to the face, arm-trap chinbar, Metalik tries to fight off, Gulak pummels him and covers for 2. Gulak puts him in a hammerlock, Metalik counters with a snapmare, sticks a boot to the jaw, revers sling blade, scales the ropes again and hits another missile dropkick, then walks across the top rope for a dicing splash and gets 2.9! Gulak goes for a suplex, Gulak blocks it, Metalik with a back drop, Gulak counters with a sunset flip, Metalik counters that and gets 2. Metalik props him on the top rope, chops him, delivers a super hurricanrana and gets another near-fall. Gulak with a shoulder thrust from the apron, Metalik catches him on his shoulders, pulls him off the ropes looking for the Metalik Driver, Gulak counters with the dragon sleeper and gets the submission victory! WINNER: DREW GULAK. Gulak shouts about the top rope, pulls his leg onto the bottom rope and the sign on top, but Tozawa's music plays and he comes out to attack Gulak! Tozawa checks on Gran Metalik after all that. Kalisto gets interviewed backstage about his confience level. 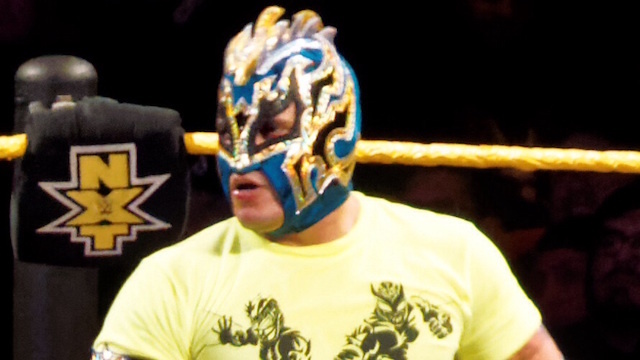 Kalisto is excited and looks forward to taking back the title. That match is next! Enzo Amore comes out with Ariya Daivari, but he doesn't do his usual promo, mainly because he lost his voice over the weekend. "My name is Ariya Daivari and your Cruiserweight Champion Enzo Amore has lost his voice. I'm going to do this on his behalf! Enzo Amore is the greatest thing to happen to 205 Live. He is the savior. I'm happy to be associated with Enzo Amore. My bank account is happy to be associated with Enzo Amore. The Bucks don't have that in common. Kalisto will not get his greasy cans on this championship." Daivari finishes with the SAWFT chant before Kalisto comes out. Kalisto dropkicks the champ out the ring, goes after him, throws him back in, Amore holds onto the ropes, and the ring skirt, Kalisto stomps on Enzo's hands and punches him down in a corner. Amore hides behind the ref, Kalisto remains aggressive, Amore tosses him out the ring, and Amore wants the ref to start counting. Kalisto makes it back in at the count of 8, Amore kicks him back out, and the ref goes back to his count. Kalisto kicks him in the head from the apron, Amore drops Kalisto, traps him in the turnbuckle, sets up for a superplex on the outside, Kalisto fights him off with punch to the noggin, but then Amore crotches him on the top rope. Amore punches him while they are on the apron, Amore goes for the Jor-dunzo, but Kalisto counters with the Windmill Driver (cartwheel death valley driver) on the apron! Amore starts to crawl away up the ramp, Kalisto throws him back to ringside, kicks him back in the ring, and they make it back in the ring at the cout of 9. Amore catches him coming in by pulling him into the turnbuckles, goes up top, Kalisto kicks him, then plants him with the tornado DDT. Kalisto gets on the top rope, Enzo kicks the ref into the ropes, Kalisto falls on his groin, and the ref calls for the bell! WINNER by DQ: Kalisto. HOWEVER, STILL Cruiserweight Champion: ENZO AMORE. KALISTO CHARGES AT AMORE WITH A RUNNING CLOTHESLINE!! The referee backs him up, Kalisto pummels him some more, and finally the referees separate them. Kalisto is back in the ring and argues with the ref who got kicked. Enzo Amore: "And still, your Cruiserweight Champion of the world, Enzo Amore. How you doin'?" That's all for 205 Live!